One of Langley's Sikorsky YR-4B/HNS-1 helicopters is seen in a wind tunnel being prepped for photos. 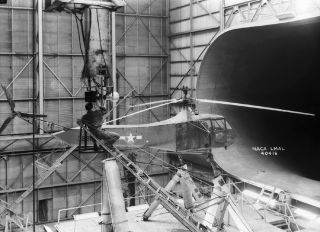 In this historical photo from the U.S. space agency, one of Langley's Sikorsky YR-4B/HNS-1 helicopters is seen in the 30 x 60 Full Scale Tunnel on Oct. 14, 1944. The technician is setting up camera equipment for stopped-action rotor-blade photos. Sikorsky built hundreds of R-4 helicopters during World War II. It was the first mass-produced helicopter.